PSG Planetary ball mill is ideally suitable for industries and educational institutions, wherever the highest degree of fineness is required. Apart from the classical mixing and size reduction processes, the mills also meet all the technical requirements for colloidal grinding. The extreme high centrifugal forces of the planetary ball mills results in very high pulverization energy and hence the time required for grinding is comparatively less. 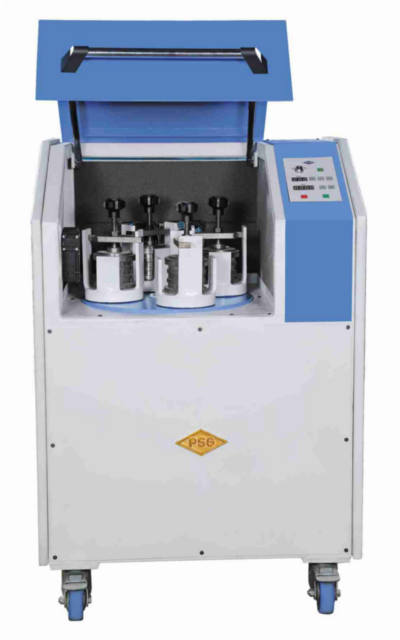 Nano particle dimensions and other physical properties can be modified by adjusting the process parameters such as grinding medium, ball ratio, ball material, motor rpm, etc., Thus, the machine would greatly help the researchers and students to learn the nano particle synthesis in bulk using top down approach. Customized set up can also be supplied. In the planetary ball mill, grinding bowls rotate on their own axis while simultaneously rotating through an arc around the central axis. The grinding bowls and material are thus subjected to centrifugal forces which constantly change in direction and intensity resulting in efficient, fast grinding processes. The grinding balls rotate against the inside wall of the bowl until under specific conditions they break away from this. After being thrown across the grinding bowl, the grinding material and the balls are impacted against the opposite wall. The energy thus created by impact is may times higher than for traditional ball mills. This results in excellent grinding performance and considerably shorter grinding times.